With guidance, accountability, and an individualised plan you can feel and look your best. As your yoga teacher, I will help you to develop a practice that caters directly to your needs. As we work together, you will begin to feel more ease in your body and become more relaxed in your mind. In addition, you will have one-to-one support and accountability as we work towards your health goals. Traditionally yoga was taught one-to-one. This is because everyone is unique. Poses are modified or adapted to meet the needs of the individual, and specific cues are emphasised for different body, mind and emotional types. In this program, I work with you 1-3 times per week, helping you to develop, maintain, and deepen a yoga practice that is tailored to your needs. I teach in the style of traditional Hatha Yoga with influences from the martial arts. With my background as a yoga teacher and Ayurvedic Practitioner, I help not only with yoga postures, but also with breathing exercises, visualisation and meditation techniques, along with advice on diet and lifestyle habits which will support your daily routine. Traditionally speaking there are only two kinds of yoga: The left-hand and the right-hand path. The right-hand path is known as Hatha Yoga with the goal of achieving Raja Yoga (the highest yoga). Shadow Yoga refers to the traditional view of Hatha Yoga and its groundwork (forms that are also termed preludes) build to assist the practitioner in climbing the mountain of Raja Yoga slowly, persistently and steadily. As you can imagine being able to climb a mountain, you have to prepare the body and mind bit by bit to not get lost or to get exhausted before you arrive. Legwork in all forms is encouraged. Deep stances and fluid movements that are partly taken from martial arts and Shaolin Qi Gong become an excellent base to enliven the breath. Breath awareness and, appropriate use is used to sharpen the practitioner’s attention as not to stumble and fall when the asana work becomes more intense. To avoid pushing yourself, you use the breath to guide you deeper into postures. Another course is in planning. The main focus of this course will be for those that are on the path already. You might not have learnt Shadow Yoga, but you are already connected to a physical regular practice that has led you to work with awareness and concentration? Once you are in the flow of a prelude and got access through the rhythm, asana work is a crucial key to dissolve old patterns. While the other course provides detailed insight into how to build momentum in you and prepare you for the seated work, this course is mainly focusing on deepening and learning Asanas (traditionally called seats). This course can be taken, if you are prepared to work at home to keep the input of the class continually evolving. Ready to get out of the city? Join us this May 2019 for The Greek Escape Yoga and Ayurveda Retreat. There is mounting evidence that workplace health promotion programming, when based on a broader, more integrated understanding of factors affecting employee health, can result in cost savings, higher productivity, and higher levels of employee engagement in organisations. It’s as simple as that. When we are healthy, we are better able to face challenges and give our best to whatever endeavour we undertake. Recent research indicates that companies who offer yoga and wellness programs to their employees reduce their annual health insurance premiums, and thereby improve their bottom line. 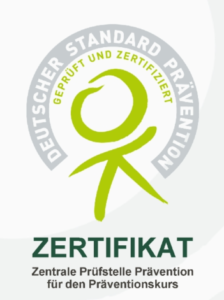 I am certified to deliver preventative Hatha Yoga Courses that are funded by public health insurer (in Germany).